The version that the Malaysia Airlines flight MH17 was downed by an air-to-air missile nearly a year ago is the one in priority, said Russia’s Investigative Committee head Vladimir Markin. He added that the rocket was not Russian made. Russia’s IC has been conducting its own investigation into the crash that saw 298 people killed in a plane crash in eastern Ukraine. Markin said that he considers the version of the MH17 downing on July 17, 2014 over eastern Ukraine by an air-to-air missile to be in priority. “Moreover, experts suppose that the rocket type established was not manufactured in Russia,” he told TASS on Wednesday. He stressed that the experts’ conclusions indicate support to the testimony Evgeny Agapov, an aviation armaments mechanic in the Ukrainian Air Force, who is under Russian state protection as “key witness” to the MH17 crash. Specifically, Agapov testified that on July 17, 2014 a Ukrainian Sukhoi Su-25 jet aircraft piloted by a “Captain Voloshin” who “set out for a military task” and returned without ammunition. Moreover, following the crash in July 2014 Russia’s Defense Ministry released military monitoring data, which showed a Kiev SU-25 jet gaining height towards the Boeing shortly before it was downed. 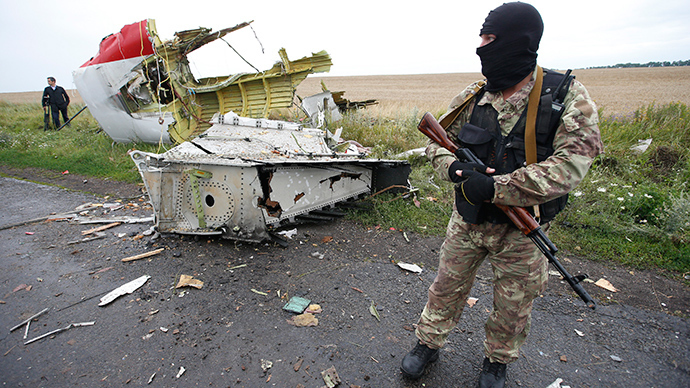 The MH17 flight heading from Amsterdam to Kuala-Lumpur crashed killing everyone on board. Since a large number of passengers on the flight were from Holland while the plane itself flew out of Amsterdam, the Dutch have been heading two international investigations into the crash: one into causes and a criminal inquiry. A report on the immediate causes of the tragedy is due to be released in the first weeks of October, the Dutch Safety Board spokesperson told RT on Wednesday. In apparent dissatisfaction by the Dutch investigation dragging for nearly a year, on Tuesday, Malaysia submitted a draft resolution to the UN Security Council on the establishment of an international tribunal to prosecute those behind the crash. However, Russia’s UN envoy Vitaly Churkin said Wednesday there are no grounds to set up a tribunal. “It’s wrong, unjustified to raise a question about creating an international tribunal after a national investigation has in fact been already carried out,” he said. There have been various media reports citing sources that allegedly saw the draft of the final Dutch report on the causes of the crash; however, they were not supported by the investigators. Most of the Western media reports have been citing anonymous officials or unconfirmed social media posts claiming that the eastern Ukrainian anti-government forces downed the plane using a surface-to-air Buk missile. The rebel authorities have repeatedly denied these allegations. On Wednesday the Donetsk National Council speaker Andrey Purgin told Interfax the Donetsk Peoples Republic weren’t in control of the territory near Torez in Donetsk Oblast where the plane crashed. “There was complete [chaos]. Only after about three months after the tragedy one could say which side [of the conflict] controlled one or the other settlement,” he said.